The U.S. Council of Muslim Organizations recently announced its formation, uniting 10 major American Muslim groups and aiming to “serve as a representative voice” for the population of about 2.75 million — a community that Pew Research surveys have found to be diverse in many ways, whether by racial or ethnic identity or political ideology. At a March 12 news conference in Washington, secretary general Oussama Jammal said the new group’s first project will be to gather information about the community before the 2016 election by conducting what he called a census, with the goal to “build up Muslims’ citizenship rights” and “create a database that will be used to enhance political participation in upcoming elections,” Jammal said. It’s unclear exactly what approach the U.S. Council of Muslim Organizations’ census will take, or what it will seek to measure. But Pew Research has conducted a pair of our own surveys of Muslim Americans, most recently in 2011. That study found that Muslims in the United States account for just under 1% of the population, according to 2011 data. The share of Muslims in the country is expected to grow in the coming decades. By 2020, we’ve projected that there will be more than 4 million Muslim Americans (1.2% of the population), and by 2030, more than 6 million (1.7%). The relatively small group is diverse in several ways. For example, no single racial or ethnic identity applies to more than 30% of the Muslim American population. And as of 2011, a majority of Muslim American adults (63%) were born outside the United States — coming from at least 77 different countries. It’s no surprise, then, that political opinions vary among U.S. Muslims. 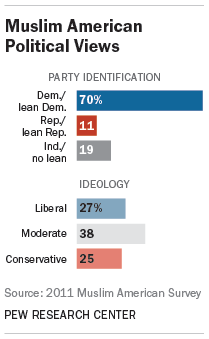 About a quarter (27%) say they are liberal, while another quarter (25%) identify as conservative; 38% say they are politically moderate. At the same time, a majority (70%) of Muslim Americans identify with the Democratic Party or lean Democratic, and a similar share (68%) say they prefer a bigger government that provides more services over a smaller government with fewer services. One of the stated goals of the new council is to increase political participation. Our survey finds that 81% of Muslim Americans are U.S. citizens; among this group, 66% say they are certain they are registered to vote (or 53% of U.S. Muslims overall). The comparable figure among the general public (including both citizens and non-citizens) is 79%. The survey also found that about half of U.S. Muslims (52%) say that Muslims are singled out by government anti-terrorism policies for increased surveillance and monitoring. Among those saying this, most (38% of Muslim Americans overall) also say that it bothers them at least somewhat.